With the exception of the professionals and some top age groupers, just about every triathlete has a discipline that scares them a little bit come race day. It is the rare athlete who can swim, bike and run fearlessly. Where in each of the three events that make up the triathlon, they feel like everything is a strength. All they have to do is hammer away. Some of us are lucky if we feel that way about 2 of the 3 disciplines. Most have really one area where they “know” they are a top performer, or are just about bumping up against their potential. I jokingly borrow a line from a friend when people ask me if I am a Triathlete – I usually respond, “No, I’m a runner who does triathlons”. But after coming dangerously close to breaking 5 hours in the Half-Ironman down in Kerrville a year ago, I really need to redefine myself just a bit. My bike has come a long way and right now it is honestly the case that I am a good to strong cyclist, a strong runner and as swimmer that needs a lot of work. With a long stretch of training leading up to Ironman Texas the swim is the one area where I feel like I can make the most progress. Part of that of course is I have a long way to travel from “lousy” to “average”. On the bike it is a matter of simply refining my form, working hard to stay aero is much as possible for the 112 mile ride and dial in my nutrition. For the run, it is as simple as getting ready to run another marathon. Something we know quite a lot about. But the swim is really a different animal. It is much more technical than either the bike or run. Yes there are mechanics to refine in the saddle or on the road – but in the water, it really is all about technique. The other piece when it comes to the swim cannot be overstated. I have to slay some inner demons. When I get ready to get in the water for a triathlon open water swim – I’m afraid. I’m not going to sugarcoat it and call it “anxiety” or “being uncomfortable”. It’s fear. Plain and simple. In the back of my mind I can see the worst case scenario. I get kicked in the head, elbowed in the face, swam on top of, pushed under – I start to panic and can’t get my breathing back under control. I have to ask for help. My race is over. On the bike I worry about things like getting a flat tire. Might cost me 5 minutes. On the run I worry about blisters or overheating – but never do I think about not being able to finish the run. But the swim carries with it some real worries and the only thing I can do is try to become as strong a swimmer as I can. The best swimmer I can be and try to get to the point where I can swim quickly enough to stay on the feet and draft off of a slightly better swimmer to help pull me along on race day. But after doing swim workouts over and over and not seeing any significant improvements, my confidence level in being able to get my 100 yard time at/under 2:00 min/100 for 2.4 miles or 4,200 yards, was really waning. Then rather unexpectedly I received a gift from a friend of mine. Two small tips or tweaks that may have unlocked something for me that 2 years of swimming had not been able to do. I was walking across S. 1st Street on Sunday afternoon heading to my car after the race downtown and saw my friend and Ironman Triathlete Gary Metcalf who owns a local timing company talking to a couple of police officers who were handling course control. We chatted for a few minutes and he asked what race I had circled on the calendar. 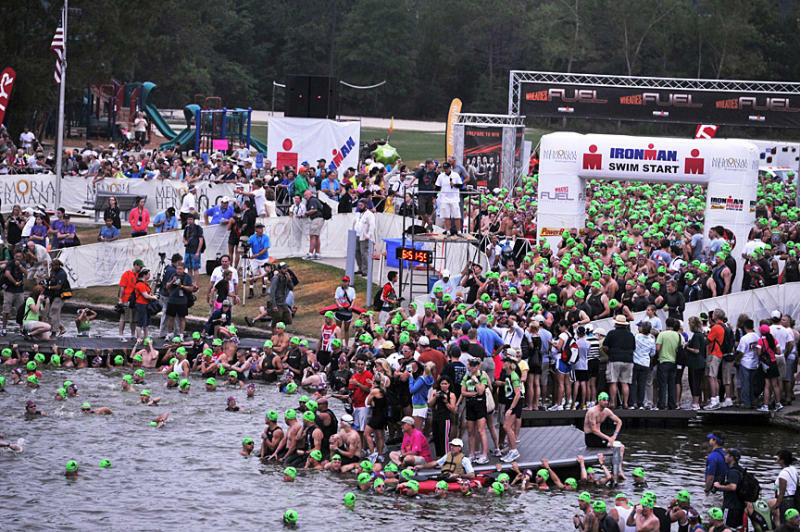 For the first time I said out loud – well, my “A” race for 2014 is Ironman Texas. The conversation quickly turned to training and I mentioned that if I could just get my swim in order before Race Day I’d be feeling pretty good about my chances at Ironman, but I had a long way to go. So I took those two tips to the pool on Tuesday and Wednesday and swam a workout that I have been doing for quite some time. It is a 1,750 yard workout that doubles as my “easy” swim day. Just enough time in the water to go hard a bit and work on form and fitness setting the stage for longer swim workouts later in the training cycle. In this workout previously I would typically swim the 100’s between 1:55 and 2:02. The 1,000 in 22:00 and my 50’s around :54. After two years of slugging it out in the water – making two small adjustments to my form I dropped 2 minutes and 24 seconds per 1000. Which is an improvement of approximately 10 minutes over the course of the Ironman Swim. The amazing thing is that I was working no harder than I was previously, and in fact to some degree I was working easier. On a length where I really held form perfectly with no hiccups I was hitting 13 strokes, 13.5 strokes per length easily. On my fast 50’s I was down in the 12.5 range. Amazing. When I was tiring at the end of the 1000 I was right at 14 to 14.5 strokes per length when I would perhaps cut something short or not pull perfectly. We’re not going for the podium or a Kona slot down in the Woodlands in May – so winning and losing really isn’t an issue. But if we are able to get out of the water in 80 minutes instead of the 90 that we were expecting – perhaps even faster if we can make some further improvements, we set ourselves up for a great day with a strong bike and solid ironman marathon. Sometimes you have to think there are powerful forces out there giving us help and guidance when we need it the most. Dom, thanks for putting Gary on that street corner for me on Sunday. This is shaping up to be quite a journey. My Dad used to tell me that one of the greatest moments of triumph for an athlete is when they stop thinking that they can achieve something and start knowing it. It is that way when you cross your first marathon finish line or come out of the water after your first open water swim in the triathlon. You start that morning thinking and hoping that you can do something, but until you reach that line on the street or pull yourself back vertical coming out of the water – everything else is just prelude. But once you “know” it – you become much more dangerous. You can run and race with much greater abandon. Until that point you automatically approach things with great reserve. You hold back ever so slightly just to “make sure” you haven’t bitten off more than you can chew. Unsure of how hard things are really going to get. Not quite certain if you have what it takes to make it. I’m going to have three such moments on May 17th at Ironman Texas wondering if I can indeed swim 2.4 miles in open water combat with 2,500 other athletes. Whether I can manage my pace and nutrition to complete a 112-mile bike leg. Then finally of course, can I run a marathon after that 7 hour warm-up? I’m sure my nerves are going to be working overtime on race day, especially treading water waiting for the Cannon to fire – but for now, I’m not too worried about it. I’m going to put in the work, swim my workouts, ride my rides and execute my runs to put myself in position to race my first Ironman. Yes finishing will be the only real goal on May 17th – but I do want to “race” the distance to the best of my talents, fitness and abilities – whatever they are on race day coming out of our training cycle. This morning however I had the breakthrough run that I have been hoping to have for the past few weeks as I returned to running from our ankle/Achilles injury training for the Big Cottonwood Marathon (run this past Saturday ironically). I had been gradually ramping up my mileage, firmly in the don’t do anything stupid phase of recovery. I had been careful not to run on back to back days. Not increasing any run more than 1 mile longer than the previous one – and running nothing faster than 6:45 pace. Taking all of those precautions is the only way I know how to return to running safely from injury without risking a set-back and more time on the shelf. The only downside to that approach is that it keeps that small doubt in the back of your mind day after day after day wondering if you are “really” better. Am I over the injury? Can you run hard without restriction or repercussion? This period of time lasts days, weeks and sometimes even a month or more when finally it will happen. I will lace up and go for a run and when I finish I will think to myself that I did not think about my injury one time during the workout. Not a single twinge, negative thought or step where I analyzed my footstrike to determine if things were normal. I just run free and easy and at the end of the trail or road as I glide to a stop it happens. I “know” that I’m whole again. Today was thankfully that day. I stretched my workout out to 8 miles with the goal of gradually increasing my effort each mile to finish under 1 hour. If I can knock out an 8-mile run in summer temperatures at 7:30 pace (60 minutes) – I know that I am relatively fit. I might not be ready to eat lightning and crap thunder. But I am back to a decent baseline where I can build from there. Today’s run started innocently enough with a warm-up mile at 7:41. I saw my friend Ed on his way to work who gave me a quick honk of his horn and then I started to gradually ramp things up. 7:27, 7:26, 7:21, 7:11, 7:16, 6:53. I was working a little bit over the last mile after grinding out an uphill 7:16 during mile 7. The equivalent of 7:00 min./mile effort up the 3/4 mile long climb. I saw my pace hovering right at Marathon Goal Pace as I closed out the run, hit my watch and finished in 58:42. Then as I cooled down I thought for the first time that I did not have even a hint of soreness or restriction on my left side. In fact, with sweat pouring off of me on the 78 degree morning, I felt pretty darn good. In a word I felt “normal”. The first time I could say that since July 24th when I stepped off of the track during my workout almost 2 months ago. And normal at this point is pretty darn exciting. 8 months from now we can worry about being in the best shape of our life for Iron Man Texas. But right now I’ll take it. It’s nice to know that we’re back. The last couple of weeks have been pretty hectic around the Marruchella house. A couple of Birthdays the last week of August, Landry – turned 3 on Aug. 29th. Dawn turned …. older …. 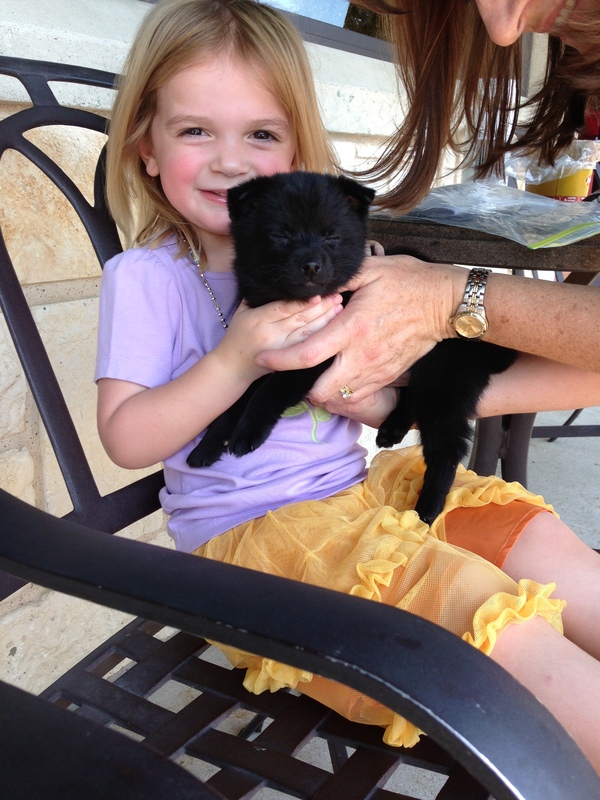 on the 31st and the following weekend we made our way up to Dallas to pick-up the newest member of the family Abby. 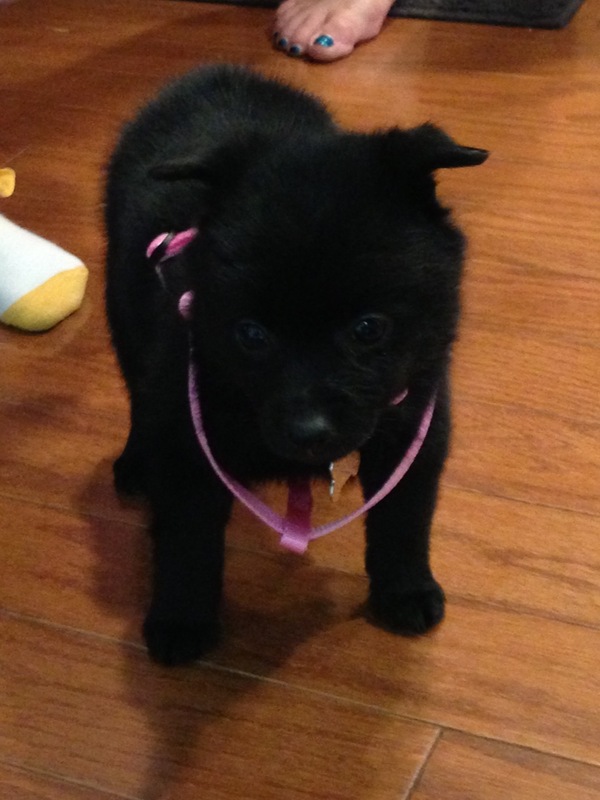 Abby is now a 10-week old Schipperke pup. The same breed our last two Dogs have been. In fact, Abby was born on July 7th in Oklahoma City, just two days after Kayla was put to rest at 17 1/2 years old. We thought that Santa was going to bring Landry a new best friend at Christmas this year, but we were fortunate to find a litter just north of Texas that had a little girl remaining. So on Labor Day weekend we drove up to our friend’s house in Frisco and met up with the breeder to bring Abby back to Austin. Landry and Abby are quickly becoming buddies – and with the exception of Abby still needing to learn what she is allowed to chew on (Toys) and what she is not (Toes, Fingers, Computer Cords, Rugs, Running Shoes, Dirty Clothes, Remote Controls, Carpet, Mulch, Grass etc.) and where to go to the bathroom (Outside) – she is fitting right in at home. The final addition to the house was a new Triathlon Bike. My trusty Cervelo P1 that got us through training for Run for Dom and a couple of podium finishes including at our first Half-Ironman was ready to be replaced. Training for Ironman and competing/completing the 112 mile bike leg was going to demand a little more than the P1 was able to give us with its aluminum frame – especially on the comfort side of things. So I spent a great deal of time looking at the TREK speed concept, Cervelo P3 and offerings from Felt and Specialized. I thought I had my mind made up to go with the Cervelo once again, but the price tag was a little more than I was willing to stomach. The bike is beautiful, comfortable and fast – but I’m not a professional triathlete. I don’t even play one on TV. I do not need a $8,000 race day set-up including my wheels. That is just silliness. I stopped into Austin Multi-Sport in Round Rock, TX – which was the last shop on my list to visit and talk bikes – when I hopped on the full-carbon Quintana Roo CD.01. Without even being fitted properly, I settled onto the saddle and down in to the aero bars and knew I had found our bike for Ironman TX. 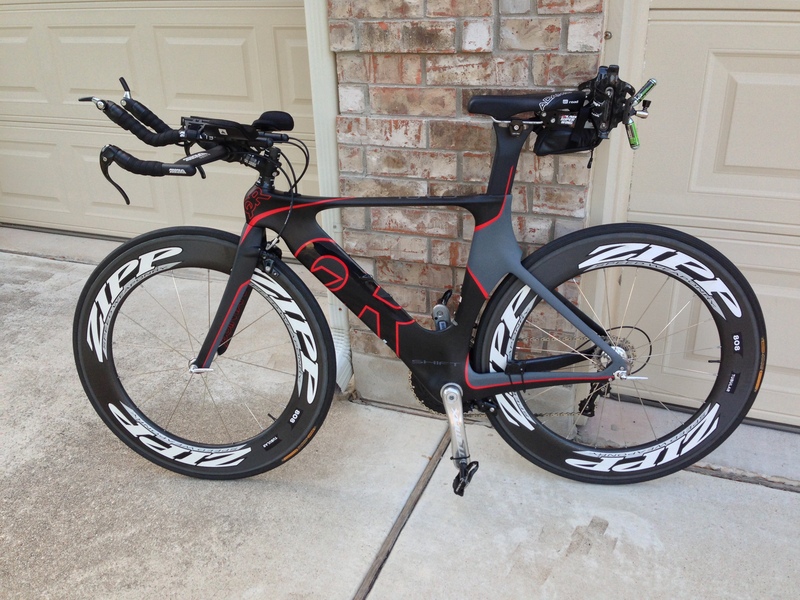 Tom Ruthven – who is coincidentally the brother of Don Ruthven at Austin Tri Cyclist who sold me the Cervelo P1 – did a great job working with me on trading in my old bike, getting the price down to the level I could stomach and gave me a professional fit. The full carbon CD.01 is very light, very smooth and with a few rides under my belt – a fast, great climbing bike. It’s also worthy of a few looks when we roll into transition in May down in The Woodlands for Ironman. By then Abby might weigh 1/2 what the Quintana Roo does. Hopefully those puppy teeth will all be grown in by then. It’s race-week at the Big Cottonwood Marathon in Salt Lake City. A weekend that I had been looking forward to since May when I started to ramp up marathon preparations. But on July 24th when we were forced to cut our track workout abruptly short during the middle of our final 400 – our race went bye-bye in the blink of an eye. I thought I would be a little bit down this week, knowing that our opportunity to re-qualify for Boston would be right in front of us this Saturday – but instead I’m pretty even-keeled about the whole thing. Nobody who trains hard and races seriously likes to pull out of an event. It is something that happens to everyone if you race long enough, but for us this makes the second straight marathon that has passed us by. Houston in January, Cottonwood in September. That makes for a tough year. That said, I’m more excited about the future than I am disappointed about the past. I’m back training pain-free, which is a blessing. In fact, even with the layoff, my fitness level is not too far away from where it normally is when we start a training cycle. I’m not totally dialed in and ready to crush a race right now, but I don’t really need to be. I don’t have an event that I really care about until December 7th on the calendar, so in the meantime we are going to build our base back on the bike, in the pool and on the trail so that when we kick off Ironman Training on November 18th, we will have a solid 10-weeks of base building in the three disciplines. An enviable position heading into Ironman Training. By the time Iron Man Texas rolls around we will have spent more than 448 hours training. If things go our way on race day and we can dial in our nutrition properly hopefully we will be able to spend just 90 minutes in the water, 345 minutes on the bike and 230 minutes on the run course. The bike will be the major focus in our training spending about 9 1/2 DAYS riding. That fitness will supplement our run training, where we will be cutting our runs down to just 3-4 workouts per week stressing quality over quantity. Our swims will build fitness of course, but will also serve as recovery workouts from all of the miles on land. Come race day, we’ll be as ready as we can be for what some people call the toughest endurance event on the planet. Finishing it is really the only goal I am going to have on race day. The same philosophy I had going into my first marathon in 2006 in Philly (3:58:08) – A time ironically that if I can lay that down at the end of a 2.4 mile swim and 112 mile bike ride, would make me very proud at Ironman Texas. I very well might run the slowest marathon I ever have on May 17th – but in a lot of ways it is sure to be my greatest. Just finish. At the end of the day, nothing else is going to matter.